Prior to liberalization, there was little scope for predatory behaviour in the aviation market. However, following deregulation, new entrants sought to compete with entrenched incumbents. Low-cost carriers (LCCs) gained significant market share, which in turn provoked many different kinds of defensive response. Having put pressure on established carriers, low-cost airlines are themselves feeling the pressure of competition from new operators. While it is normal and natural for airlines to react to competition - modifying their services, the ways in which they offer them and their prices - when does aggressive commercial behaviour go too far and become predation? 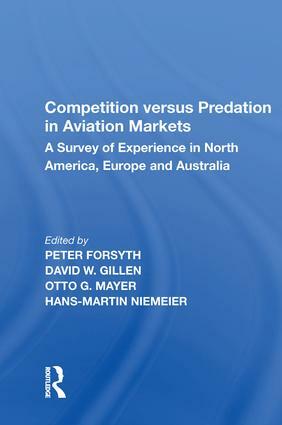 This book considers what exactly is meant by 'predation' in the aviation environment, and explores the strategies LCCs adopt in order to gain market share, as well as the strategies of the established airlines in response to competition from new entrants to the market. It also addresses the key question of what competition policy should do to ensure intensive competition. Competition versus Predation in Aviation Markets brings together contributions from around the world, from airlines, government agencies, leading academics and consultants, providing a wealth of perspectives on a business practice crucial to airline survival. Contents: Competition and Predation - Surveys from Different Perspectives: Strategic behaviour of incumbents, Kai Hüschelrath; Predatory pricing: still a rare occurrence? Ashish Lall; Competition and predation, Ruwantissa Abeyratne. Australia and New Zealand: Predatory behaviour in Australian aviation markets, Peter Forsyth; When does airline competition become predation? David Greig. North America: Predation in aviation: the North-American divide, David W. Gillen and Ashish Lall; Airline predation in Canada, Scott M. Butler; Most low-cost airlines fail(ed): why did Southwest Airlines prosper? Andreas Knorr and Andreas Arndt. Europe: The Lufthansa-Germania case at a glance, Kai Hüschelrath; Predatory pricing in the airline industry as a challenge to competition law enforcement, Christian Ewald; The European 'No-Frills'-aviation market: current and future developments, Bernard Michael Gilroy, Elmar Lukas and Tobias Volpert. Theoretical and Policy Aspects of Predatory Pricing and Competition: A case of beer and pretzels, William G. Morrison; Investigating airline managers' perception of route entry barriers: a questionnaire-based approach, Mirko C.A. Schnell; Why do low cost carriers arise and how can they survive the competitive responses of established airlines? a theoretical explanation, Markus Reisinger; A capacity lock-in rule, David Starkie; Wide angle preying in land modes? the problem of missing modes, Marc Gaudry; An economic framework for assessing predation in air services: markets, barriers to entry, market power and tests, Colin A. Gannon.